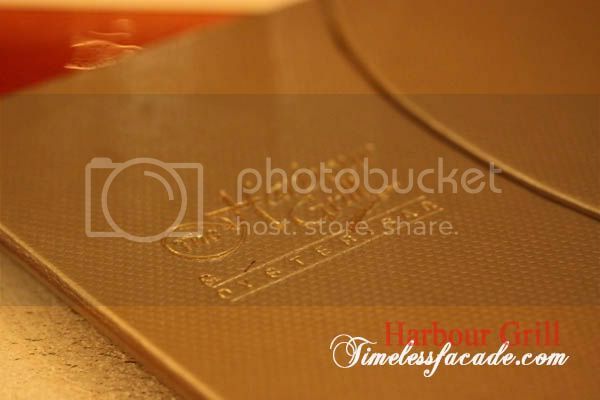 Harbour Grill & Oyster Bar has been around for quite a while yet little has been mentioned about it in the media. 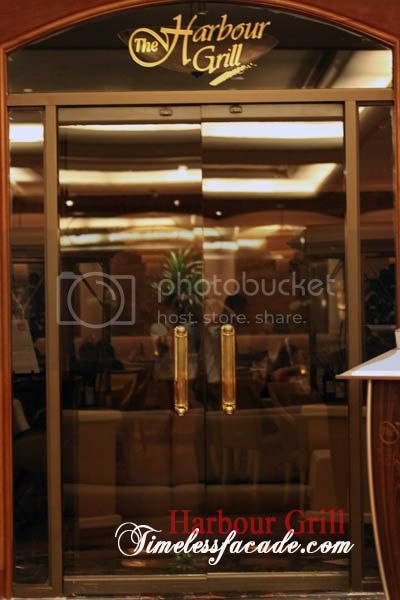 Its probably one of those more reclusive restaurants around. And by a stroke of impulse, I had dinner there one evening. 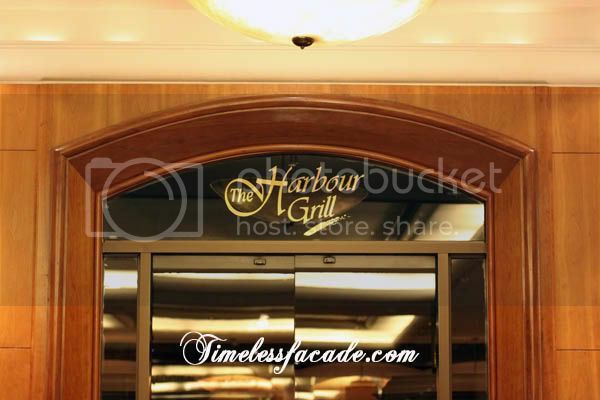 Unassumingly located in a corner on the third level of Hilton Hotel, Harbour Grill looks almost foreboding with its tall dark tinted glass doors that are always kept shut. Only when approaching them would the impeccably dressed counter staff swing it inwards to welcome you. 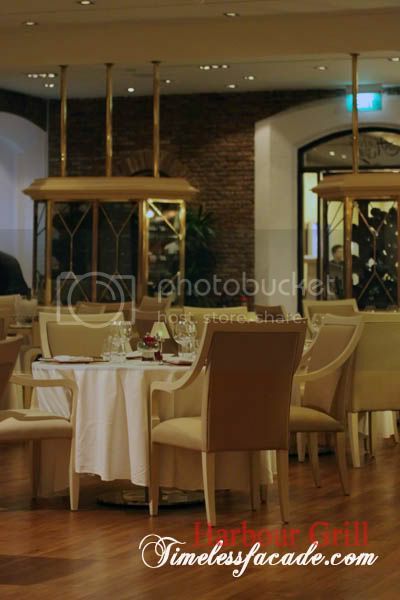 Decor is classic chic with hints of victorian complete with parquet flooring, exposed brick walls and lovely booth seats. 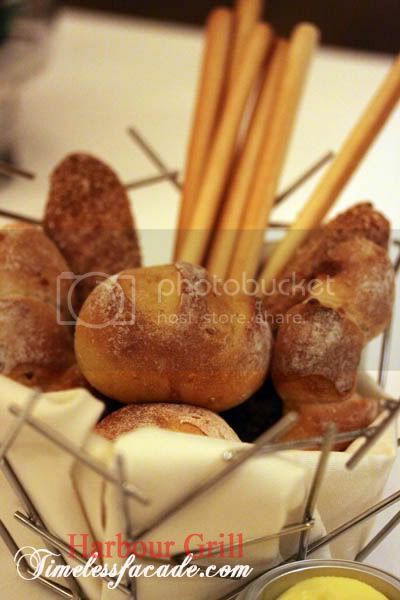 The basket of complimentary bread consisted of a variety of different breads - cheese bread, bread sticks, multigrain and olive bread. Interestingly, the cheese bread was soft and fluffy with a mild curry taste. That's not to say that I could really stomach the cheese + curry combination though. The olive bread had small pockts of olive in it. Quite decent. 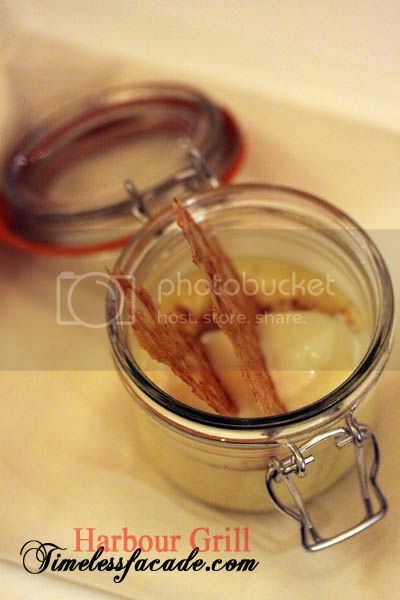 A simple yet well done amuse bouche of smoked salmon with pomelo. Nice and chilled sans the overwhelming raw taste of smoked salmon. Salty yet sweet. 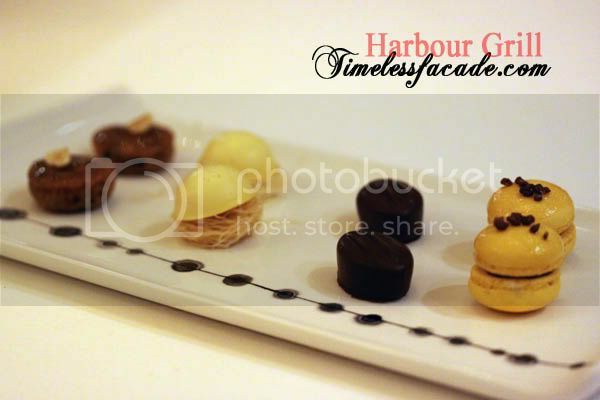 Most places would just pan fry foie gras, but not at Harbour Grill. 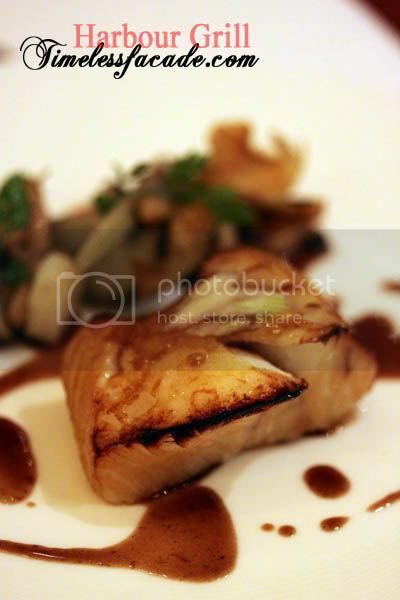 The foie gras is first boiled and then pan fried till a little crisp on the outside (reminded me of Inagiku's). 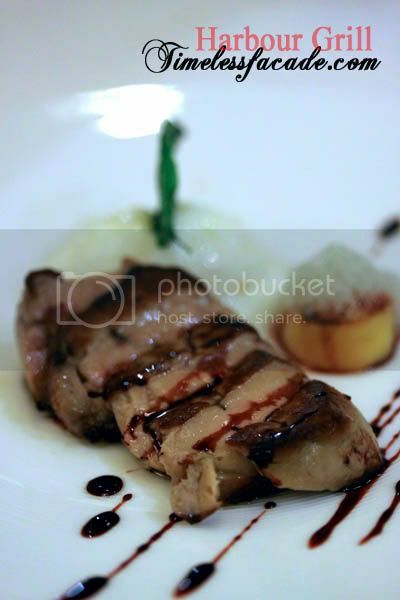 The only downside to this is the absence of the quivery texture that graces most well done pan seared foie gras. That is not to say that Harbour Grill's rendition was no good. In fact, I found it quite tasteful in its own way. 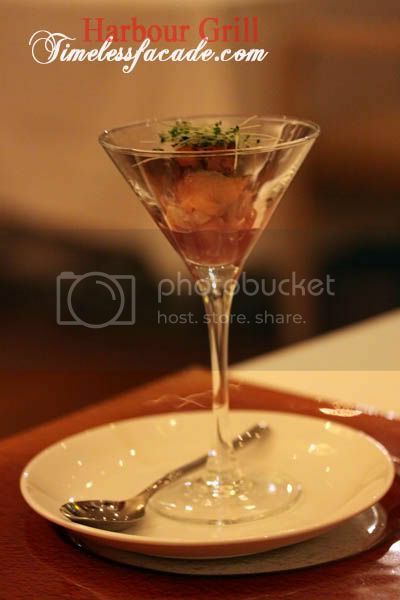 There was no overwhelming liver taste and when coupled with the cold pineapple sorbet, it made for a very interesting and light appetiser. 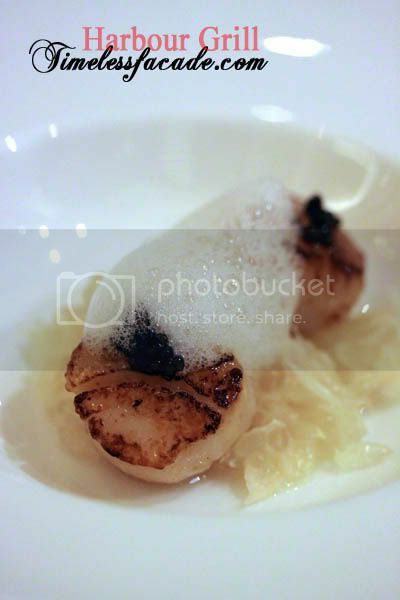 I thought that the scallops were nothing short of excellent. Pan seared till a little charred on the surface yet retaining its moisture, sweetness and tenderness on the inside. 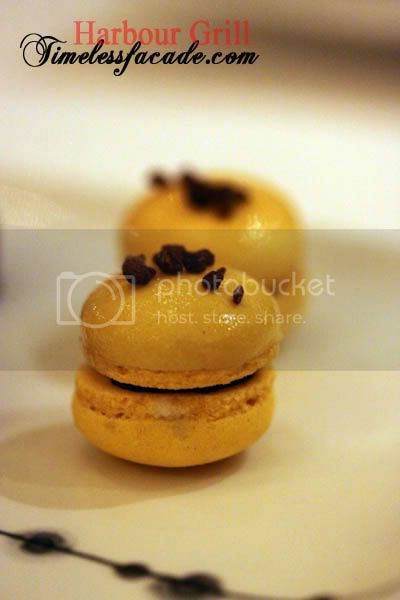 Just watch out for the small portions (2 pcs) and the high price tag. $35 (small) and $48 (large). Ouch! The ribs were done medium rare as per request and lightly seasoned with salt and a drizzling of wine. Tender with a nice beefy taste but a tad too salty for my liking. The accompanying home made potatoes were purportedly cooked confit style but I honestly didn't quite take to them. The cod fish had charred edges, which hinted of possible pan frying after being steamed. And this was real cod fish, not chilean sea bass or the likes. The flesh was firm and sweet and honestly tasted like miso cod to me. Very nice. I liked this dessert quite a bit. The pudding was smooth and creamy with a hint of chocolaty overtones. It was topped with pineapple sorbet that provided a nice zesty twang. Think sweet and mildly sour. Apparently one of Harbour Grill's signature desserts, the grand marnier souffle came with a scoop of orange sorbet that was nice but seemed a little out of place. 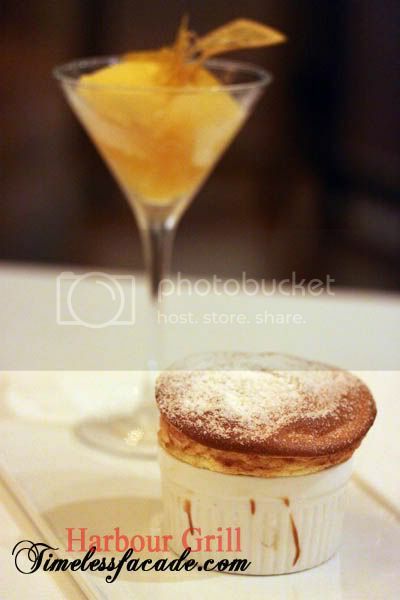 The souffle itself had a high egg content and the alcohol was apparent. However, I understand that a good souffle isn't suppose to be that firm though. 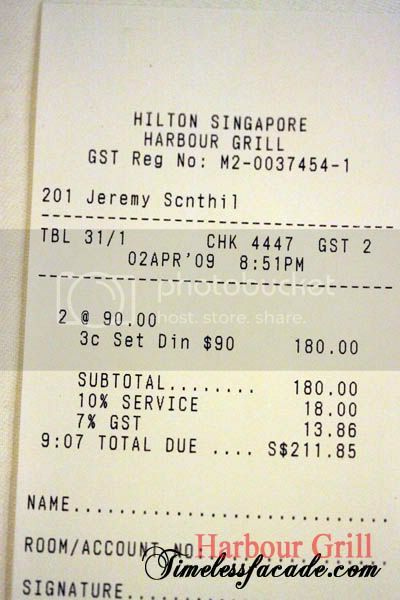 A 3 course dinner for 2 pax respectively cost just over $210, which catapults it into the expensive terrain. If 3 courses isn't enough, there is the 4 course option at $120++. Service is excellent and non intrusive while food quality is evident as well. 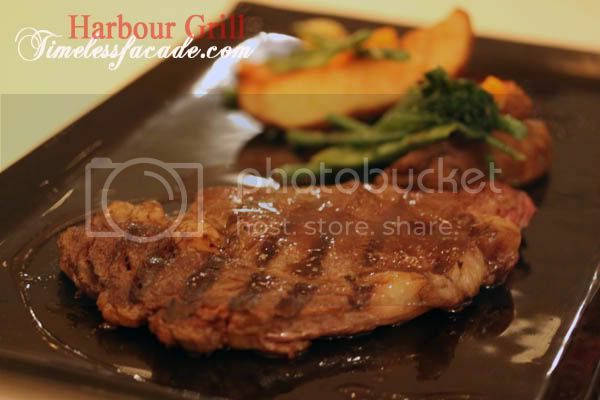 Throw in a nice charming environment and Harbour Grill automatically makes it to the "special occasion" list. Definitely a place to impress. How do you know the fish is a "real cod"? Stating it as "codfish" doesn't necessarily mean it's a real cod. It could be "black cod" which is a not real cod. I think you can taste the difference? Especially if the person eating it has eaten alot of it? lol.